With flat double-edged blade tapering to a blunt point, both sides cut with a central fuller running from the base of the ricasso to a point approximately two-thirds of the total length, the fullers each stamped with a series of letters at the forte, LOPC on one face and PVIG on the other, and cut with an Arabic inscription on one face below the hilt, the tang fitted with horizontal cross-guard of rectangular section swelling slightly in the middle, and robust cubic pommel cut to form a central octagonal band of rectangular facets with further faceted bands around the top and bottom. Following the Ottoman conquest of the Mamluk Empire in 1517, a collection of European swords with dedicatory inscriptions datable to the period 1365-1437 were removed from the Mamluk arsenal in Alexandria. Sixty-two of these are preserved in the Askeri Museum in Istanbul, one is in the Topkapi Saray collection, and at least twenty-five were dispersed to Europe. The group are of Italian and German origin and are typologically diverse. The inscriptions attesting to their Mamluk ownership frequently include the name of the donor to the arsenal and the date of the deposit. In the absence of an inscribed date all of these swords are datable by virtue of the wording and of the epigraphy used; therein lies the importance of this group to modern scholars. Although the full inscription on this sword can not be read it includes the word Alexandria written in a script very similar to that on one in the Askeri Museum, dated to about 1436-37. Many of the Alexandria swords are connected with the invasions of Peter de Lusignan, King of Cyprus, whose crusading force sacked Alexandria in 1375. It appears likely that the initial deposit in the arsenal was made from swords captured from a small contingent of the booty-laden withdrawing force. In 1425, in response to Cypriot raids on the Syrian coast, the Mamluk Sultan Al Ashraf Sayf al-Din Barsbay invaded and conquered Cyprus. His army returned in the following year, complete with the humiliated Cypriot King Janus. The ransom included annual payments of Tribute which no doubt included further gifts of swords. Is this a Type XIII? It seems like it isn't quite two handed and has a big blunt tip, but it is hard to tell. Anybody know for sure? Actually reading the dimensions maybe a type XI? It looks like either a XII or XIIIb to me. The proportions are misleading, as it looks like a hand-and-a-half size until one reads the measurements. If the blade length is 27", the grip would seem to be of single-hand (XII or XIIIb) length rather than the longish-gripped XIII. Perhaps the blade was originally a bit longer but had the tip broken off and reground? It's way too short to be an XI. I can't see it in the photos, but the text mentions a ricasso. If there is one, I'd ID it as a type XIX. ... yeah, I think I'm going to stick this one under "Unclassified", as I can't think of a single Oakeshott type that it could fit neatly into. Keep in mind that Oakeshott himself admitted that there were many originals that simply didn't fit in his typology, so this is certainly not to be unexpected by any stretch of the imagination. I love that pommel! 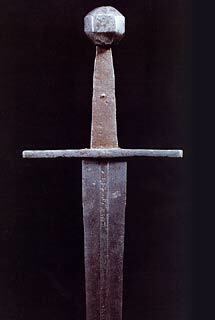 Overall, I think it is a very elegant sword, definitely oriented toward the cut. I could easily picture that used in conjunction with a sizeable shield on foot. And what about the curvature at the bottom of the blade nearing the hilt? is that only from honing or was that part of the sword's design? Also, isn't the fuller unusual, almost modern-looking in a machined sort of way? You can see the ricasso in the larger photo if you look carefully, by the way the light is reflected from the metal - the gleam on sharp edges is perceivably different from that on blunt ones. If it's any help, I've marked my impression of the approximate extent of the blunt portion in the pic attached to this post. According to the text the fuller runs form the base of the ricasso!?!?!?!??!?!?!?!? to a point 2/3 down the blade. I think they completely misused the term ricasso, as the fuller reaches at least to the hilt. My recollection is that racassos are relatively late addition to sword design, and I would suspect that this one does NOT have one. The wider portion on the strong of the blade is not uncommon. Just look the Tritonia sword on Albion's website (type XIIIb). There does seem to be some blade geometry difference in that "ricasso" section but it might be the picture, or it might be that even if there is blade geometry difference, the section is still relatively sharp, or at least slanting towards blunter edge. This difference is not apparent on the lower picture so I'd think is the light playing tricks. In my unexperienced opinion this is type XIII, but I might be wrong. P.S. Maybe I should have been more careful. Which base of the "ricasso" were they referring to?? I assumed in my argument above that referred to the hilt-distal part of the "ricasso", but likely they meant the hilt-proximal part. In the latter case they may not have misused the term "ricasso". Perhaps the top portion of the blade is simply left unsharpened, ignored while honing the rest of the blade, like on so many other historical specimens? This might explain the (erroneous) reference to a ricasso on a blade that doesn't seem like it should have one, and of course would also go some way in explaining the relatively uneven and asymmetrical variations in the blade's profile. I also think the term "riccasso" is wrongly used. However, I think it depends on if that small section near the cross has ever showed any signs of sharpening. However, it was not unusual for sword NOT to be sharpened that high up the blade. To me, it looks as if this sword's edge has either been resharpened or rweorked a lot. If that is so, then I find this specimen really exciting. This would indicate some kind of prior edge damage, probably from actual battlefield use during the disasterous invasion of Egypt ! Image some knight weilding this sword on a crusade! Amazing. If you look at the second photo in Nathan's original post, you can see that the first 2 inches or so reflects the light brightly, then darkens immediately after those first two inches. This tells me that the angle of deflection is different, hence it would not be an uneducated guess to say that the first two inches are flat, then begins a distal taper. That the change in reflection is so dramatic only reinforces this possibility. This initial flat surface is, at least in my perception, an effective ricasso. In fact, I've adjusted my color settings multiple times while looking at this pair of photos, and I can swear I see a point about 2 to 2.5 inches from the cross where the ricasso forms a cusp-like curve toward the spine as it transitions from ricasso to edge. As Angus Trim put it to me, one of the structural benefits of a ricasso is that it effectively shortens the length of the blade. The shorter the blade, the greater the relative degree of stiffness (yes, Gus, I realize I've really, really oversimplified it). A stiffer blade can help yield more blade presence, perhaps to the taste of the sword's wielder? P.P.S.- As I said before, there is no point in trying to pigeonhole this sword into an Oakeshott type... if it turns out to have a ricasso, all bets are off. Assuming I'm wrong about the ricasso, the closest Oakeshott type this sword can be stuck in would be XIIIb (don't forget that the non-suffix XIII has a long grip, 5.5 to 6 inches), and even then it isn't a very tidy fit. I got the point about apparent light difference that causes the perception of a ricasso. This could be due to the difference in the blade geometry (either a true ricasso or just less sharpened or worked on strong of the blade), or unintended lighting tricks during the photography. We cannot figure it out for certain until we see a side shot of the blade. The grip is about 5in so I guess it is a bit short for XIII id we follow the numbers you cite. I have no problem calling it XIIIb. 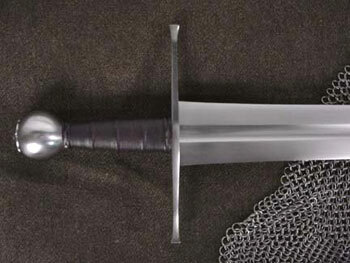 This sword has resurfaced and will be offered at auction by Bonhams next month. The inscription is described as indistinct, "appearing" to contain the name Alexandria, and the estimated price is a small fraction of what some other Alexandrian swords have sold for... I wonder if there are some doubts as to the provenance of this one? Such lovely, huge photos they have!